Welcome to this tutorial. Here we are going through all necessary steps to build a native app for Android / iOS that makes use of Onirix’s Targets technology. The goal of this tutorial is to create an app that runs on your AR compatible device and allows us to place 3D content on a surface as part of an Augmented Reality scene. We will start by creating a new project in the studio. In this Getting Started video you can see how to create your first project in Onirix. Inside the project we create a new Target, and use the scene editor to place our first 3D model. Follow this video from 0:33 to 1:45 and then continue reading. You can take a look to our Scene editor page if you want to know more about this. This script will hold the Target Oid referencing Onirix Studio. To be able to set this value from the inspector, instead having to set them as script constants, we will add to them the SerializeField attribute. The UI screen that we will design must have a button that allows us to place the Target and a label to show status messages. From this script we will subscribe to the button events, and we will set the text of the label, so we need a reference to those components. We will declare them with the SerializeField attribute to bind them to the pertinent object later from the inspector. 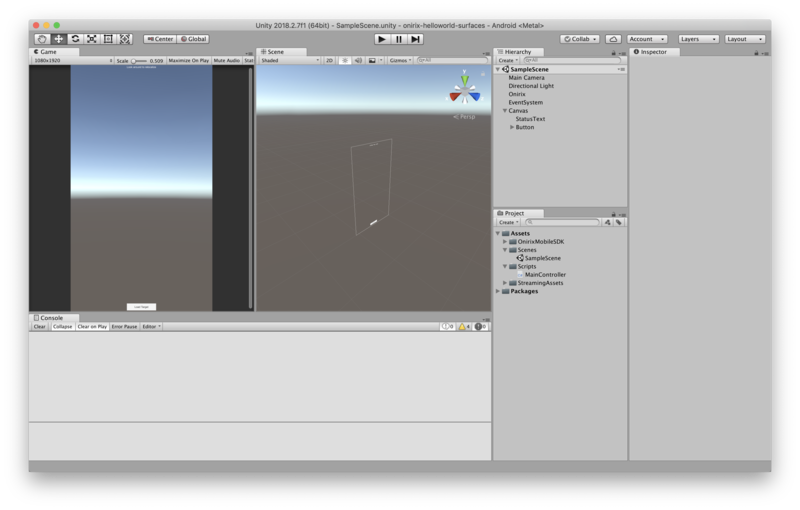 Remember that UnityEngine.UI must be imported for the use of the Button and Text classes. Then, we will add this script as Component to the Onirix scene object to ensure that it will be executed when the scene is loaded. The fields marked as SerializeField will be now available from the inspector. For the design of the screen, we will instantiate a Canvas object in the hierarchy and then we will set the desired reference resolution (1920x1080 seems ok). We will then add a Button and a Text as children objects, setting its desired size and alignment. We will also replace the text of the Button (in the child label object) to "Load Target" and the one of the Text object to "Look around to detect surfaces". At this point, since our MainController inherits from MonoBehavior, we can implement the Start method to define how it will behave when the application starts. The first thing we will do is preventing the screen from entering to energy saving mode. We will also take the opportunity to set the button initial status to not interactive. Then we must start the surface detection, but we must wait for the OnirixMobileManager to be initialized before. For this purpose, we will implement an auxiliary method that will be launched as Coroutine and that will invoke the passed callback when it is ready. Once the OnirixMobileManager is ready we can start to deal with the surface detection. We will call the StartSurfaceDetection method of the MobileManager. It receives two callbacks: the first indicates when a surface has been detected and the second tells us whether the surface was lost. In those callbacks we will show the relevant message on our Text label and enable or disable the Button as appropriate. The complete code for the OnirixMobileManager startup and the surface detection callbacks is shown below. Finally, we will code the behavior for the button, which will load the chosen Target, it will show a message on the label, disable the button and hide the crosshair. Link your app with Onirix Studio is pretty straightforward. We have just to fill the required inspector fields for every script with the appropiate information. From the Project List on the Onirix Studio web interface we can copy to clipboard the Project Token by clicking on the three dots icon at the top-right corner of our project entry and pressing the Copy button. We can now paste it on the corresponding inspector field for the OnirixAuthManager script. Getting the Target Oid is just as simple. On the Onirix Studio web interface we will choose the desired target to enter the 3D target editor screen. There, in the property editor at the top right of the screen, we will see the oid for the chosen target and we will be able to copy it just by clicking on the button with two overlapping squares. We will paste it on the corresponding inspector field for our MainController script. If you are reading this, you probably have your own Hello World Surfaces app on your mobile device at this point. In that case: congratulations! You have successfully completed this tutorial.